Time for another vacation! As we like to say, you can only have a vacation if you have a job, and we have escaped to the Cinque Terre for hiking and seaside relaxation. Here are a few favorite shots from the past three days. We will be here until Friday, so more to come! We arrived in Manarola (town #2 as some call it) in the Cinque Terre on Sunday afternoon by train from Rome. Headed out on a familiarization walk above the town, through the vineyards and down to the sea. Here a view back toward the town and its gelato-colored buildings. 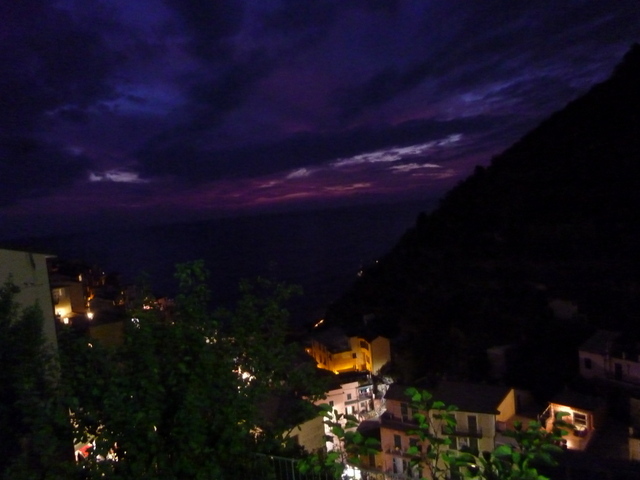 As night fell, we walked to the upper part of town and settled in at the charming Trattoria dal Billy. Too bad we ate our beautiful seafood before I thought to take a picture. The view was intoxicating! The walk up is quite a climb, but the food and service made it worth the effort. Apologies for the crap smudges on my lens. Ugh! Monday we traveled down the Ligurian coast to Lerici on the Gulf of Poets. Byron, Shelley, and D.H. Lawrence found this little corner of Italy to their liking as well. It’s a beach resort town in summer. On an autumn day it was still warm, but quiet in a post-season way. 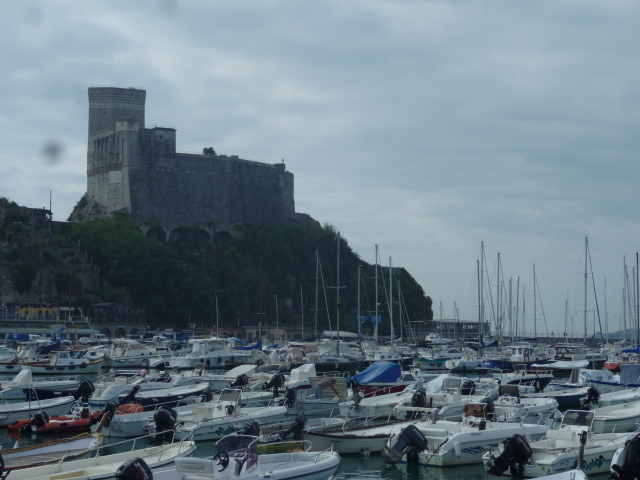 Pictured is Lerici Castle. 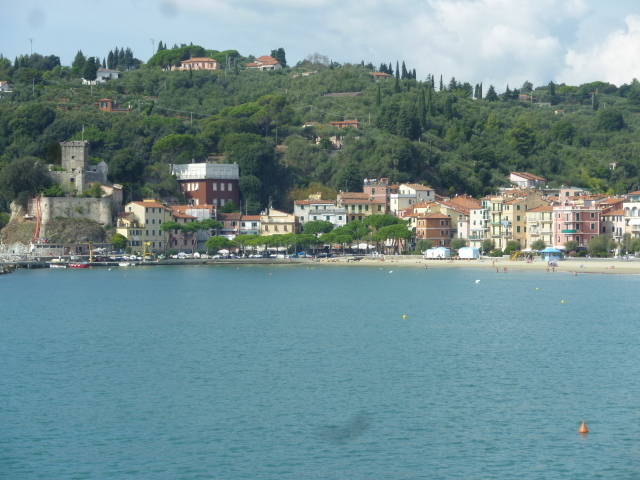 We walked from one end of the gulf to the other and back: Lerici to San Terenzo (pictured). I think we were the only non-Italians in the whole area. So peaceful! There were still some late season sun worshipers on the almost-deserted beaches. Thanks to the blog http://www.apathtolunch.com/ for the guidance! Many of you know Ric and I usually took an autumn trip to Cannon Beach, OR. This is our replacement for that habitual break. A little different, though…. 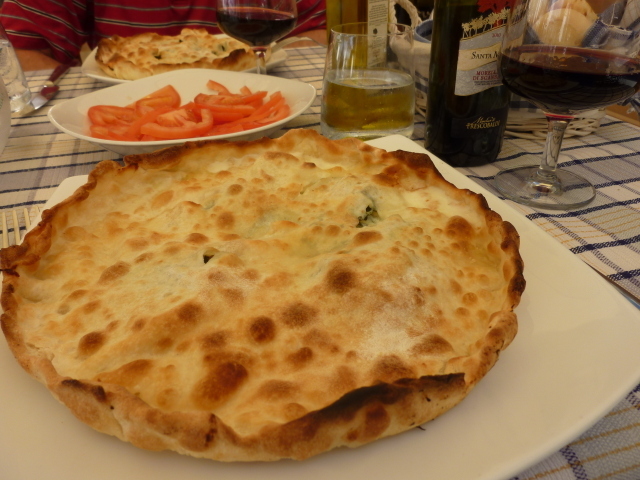 Foccacia is a Ligurian specialty. Here it is in a very thin form, with a filling of spinach and a little sausage, freshly baked for our lunch, served with tomatoes and red wine. Could not finish it! 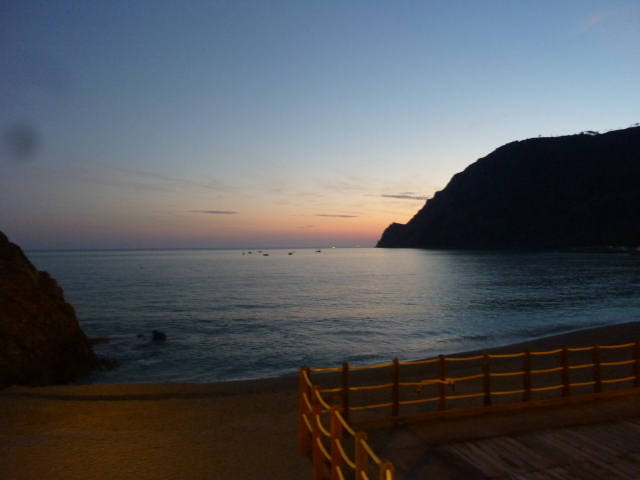 In the evening we went to the northernmost end of the Cinque Terre, Monterosso al Mare, for dinner and enjoyed this sunset. At dinner, we were delighted to meet Christine, an American woman living in Monterosso, working at Cantina di Miky, and authoress of the blog, http://lifeinliguria.blogspot.com/ which I have been reading for months. GREAT MEAL! Again, photo not taken because we were so busy consuming beautifully prepared seafood. We awoke to rain, by the time we had eaten breakfast, it had stopped and the sun was peeking out from broken clouds. Hopped a bio-diesel shuttle for transport to Il Sentiero Rosso, the red trail, high above the sea. The land has been terraced for centuries. The path passes through vineyards, olive groves, and gardens at a dizzying height. 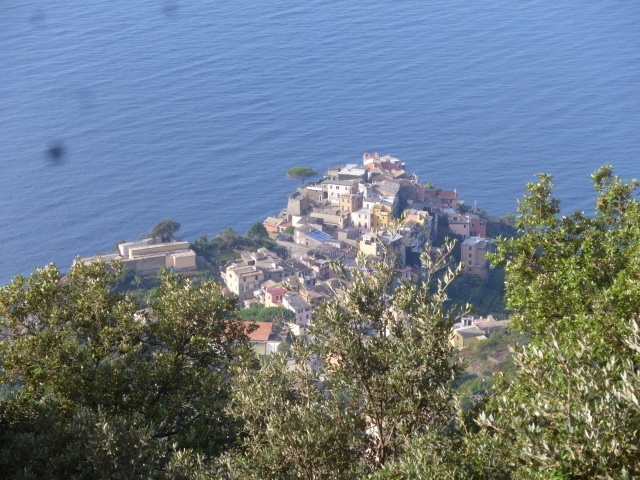 The town of Corniglia (pronounced cor-KNEE-lee-a), from high-above. Once we descended to Corniglia on a very challenging footpath, we still had 400 brick steps to descend to the train station. A view over the Ligurian Sea, from high above Corniglia looking toward Monterosso. Alas, it is almost dinner time and we are eating with “The Pirates” in Vernazza! Dobbiamo andare via! 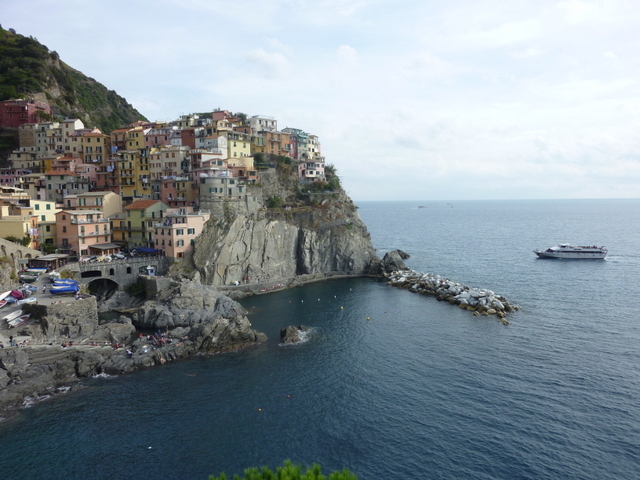 It’s great to hear that you had such a wonderful time in the Cinque Terre. I read your post on the trip to Portofino as well, and I also found that to be an expensive place to visit. I’m now back from my trip and also had an incredible time in the Cinque Terre (and of course some great food). I owe you are note! Enjoyed your trip via your comprehensive blog! We have Sicily high on our list of places to go. The scenery is beautiful! Love the little towns on the edges of the cliffs to the sea. Hi Anita! It’s so different from Oregon. 🙂 We love the tumbling little towns too. Imagine the construction 500 years ago! Even now the heavy materials are hauled up those steep streets on the backs of young men. Beautiful!! So happy you are both loving Italy and getting the opportunity to explore!! Definitely a place that Wally and I should visit one day!! Much love!! Ciao a tutti!! Yes you must put other parts of Italy on your list, now that you have been to Sicilia twice! Liguria, Venice, i dolomiti, Tuscany, Umbria: all great! MIss you guys! PS I moved to Peterkort woods – up and bought a condo here. Look forward to having you over when you return. Seriously, glad you found a place! The neighborhood can’t be the same without us! What a joy…. so fun to follow your life. Sounds like your job is going well and getting to know your surroundings. Miss you so much . Portland is enjoying a most beautiful fall and summer was just great . Do they do Halloween there ? Thanks, Mary. I miss you, too. You have no idea how much. I need to do a post on pedicures here. Not sure about Halloween, but I understand not like in the U.S., no trick-or-treat. I’ll let you know when it’s over. We do get November 1 as a holiday, though, All Saints’ Day. Carolyn, I always finish my wine. Enjoy the rains! Great to meet you too, and the meal was fabulous! 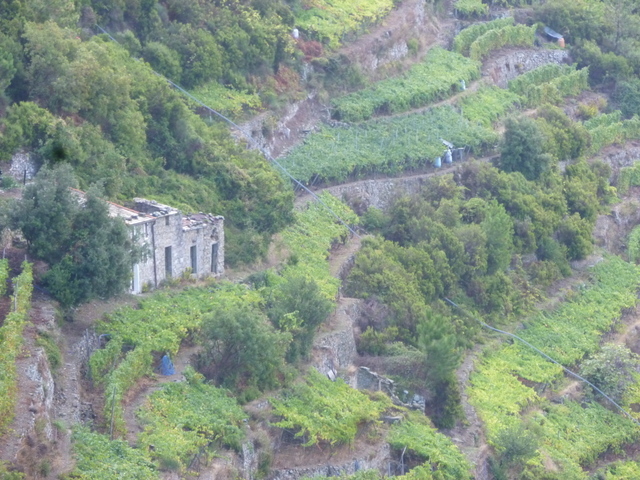 Oh, I so love that area … and vividly remember the steps from Corniglia to the train station. You guys are doing some seriously hiking and enjoying every minute. Thanks, Karen. Just trying to seize the day! Great travelog! I LOVE LOVE LOVE cinque terre! You two are on you second, third, fourth or fifth honeymoon??? Ciao, cara! 28 years together, no end in sight! This is a great time in our lives to be doing what we ae doing. Come and see us! Loved the night photo. Want the recipe for the foccacia. Kim, I didn’t make the foccacia, I ate it! Maybe you should come over and we’ll find a cooking class. You and Mark would LOVE the seafood here in Liguria! Barton-are you getting any work done? No fair! Thanks for the pix – we love that part of Italy. 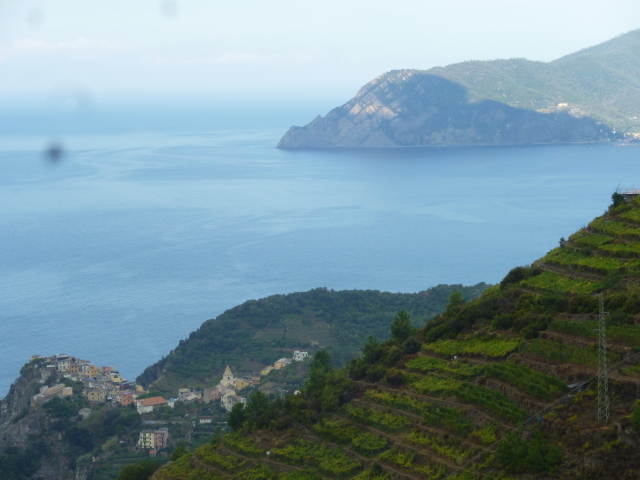 We stayed in Vernazza several years ago and took the same hike high above the Med. It was brutally hot – more like a death march than a hike! In addition, I lived in Livorno as a boy during the early 50’s – we lived in a villa in Terrania. My Father was in the Army stationed at Camp Darby – I think it is still there. Hi Will. Looking forward to meeting you and Gracia when you come in November! Beautiful pictures. What a great life the two of you have. Thanks for sharing. Hi Diana. Glad you are enjoying the blog. Miss you guys!